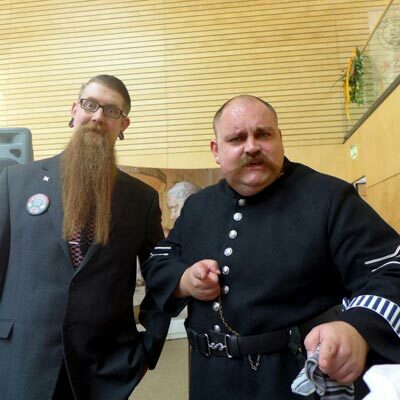 Saturday 3rd October saw the Austrian town of Leogang hosting the World Beard and Moustache Championships and numerous members of the HBC were present to represent the Club. Over 350 competitors from across the globe entered the competition and the small alpine town was soon bristling with activity from Friday night onwards, with live music and Austrian hospitality in full flow. 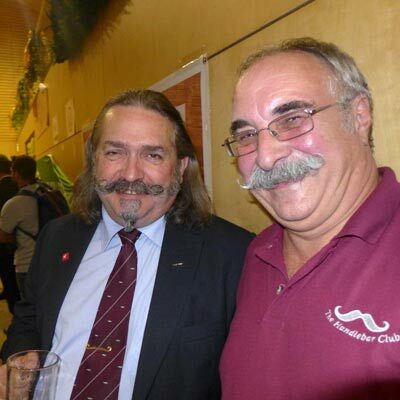 The pre-competition convivial gathering gave HBC members the chance to catch up with many of our European friends over a generous quantity of beer and food, including the Snorrenclub Antwerpen and the Svenska Mustaschklubben (Dan Sederowski very kindly providing the transport from Munich Airport to the venue). Also in attendance were many members of The British Beard Club and the Wessex Beardsmen to name but a few. ‘Krainerwind’, a local traditional band celebrating its five year anniversary provided the musical entertainment into the small hours of the morning. 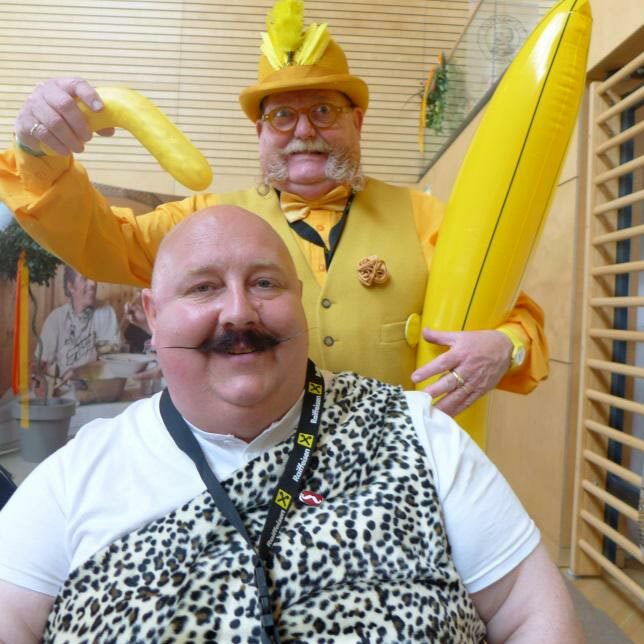 Saturday saw the competition beginning in earnest, and Club members decked themselves out in their usual range of eclectic outfits to try and impress the judges. 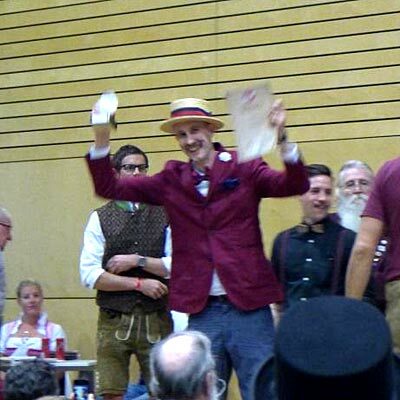 Most categories provided stiff competition from the USA and Germany, but the atmosphere was very jovial and many new friends were made amongst the hubbub. One unexpected guest amongst the crowd was former �Eurotrash� presenter and French film director Antoine De Caunes. Antoine was covering the event for a new series he is producing on Studio Canal and was more than happy to pose for photographs and join in the usual nonsensical conversations. Members Ryan Pike and Allan Robinson flanking former Eurotrash presenter Antoine De Caunes, posing for photographs pre-competition. Antoine took the time to meet and talk to many of those gathered and was even seen cheering on some HBC members when the results came in. 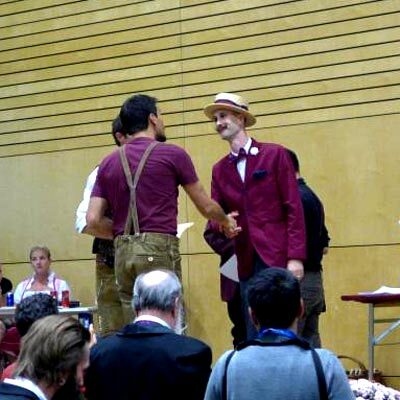 The results of the competition came in about 9.30 pm and the HBC were amongst the medal tables: Bruce Roe collecting Third Place in the Hungarian Moustache Category and Johnny King being crowned the World Champion in the Dali Moustache Category. Johnny King claims the World Dali Crown! Predictably, the celebrations went on to the early morning with many a sore head the next day to prove what a good time was had. Further good news arrived later on when it was announced by the WBMA that Antwerp had successfully won the bid to hold the 2019 World Championships, something we are all now looking forward to.